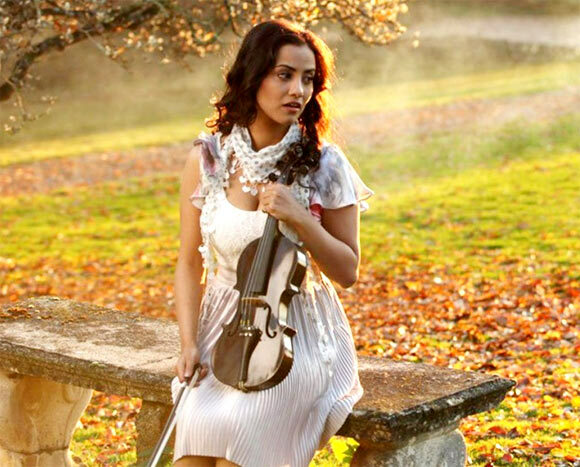 After making a confident debut in Haunted, Tia Bajpai's second film, Lanka, failed miserably at the box office. Now the actress is back with another horror film, 1920 Evil Returns. The film is produced by Vikram Bhatt. Tia's co-star is Aftab Shivdasni. In this interview with Sonil Dedhia, Tia talks about her fascination for horror films and why she prefers challenging roles to being a glamour gal. Two of the three films you have acted in have been horror films. Why this fascination for this genre? (Laughs)You can call it a fascination. I like horror films. I am fascinated by the kind of characters that I was offered in Haunted and this film. But horror films in recent years haven't done well at the box office. We need to make a good horror film. People are very conscious about the kind of films they want to see. The audience has matured over the years and doesn't want to watch gory horror films. According to me, horror films are getting sexier (winks). The film is a sequel to the 2008 hit film 1920. There are many similarities between the original and the sequel. 1920 was a different film altogether. Comparing it with our film won't be fair. The characters in the two films are completely different. I agree that the two main protagonists get possessed by ghosts, but that doesn't make the films similar. It is a franchise and not a sequel to 1920. You play the character of a girl who is possessed by a ghost. Did you find it scary playing the role? I was a little nervous playing this part because in subjects like these, it is a little difficult to come out of the character. My character in the film is spooky. The whole idea was to look convincingly scary. Honestly, the first time I saw myself in the mirror after getting into the character of a ghost, I was completely scared. For a moment I closed my eyes. There were a couple of scenes which scared me a lot. Did playing such a character work on your mind? I couldn't get the possessed woman out of my mind. When I went home after shooting the film I would still make the faces my character does in the film. I didn't want to come out of my character till I completed the film. I would lock myself in the room and be alone for hours. I think this is the toughest character that I have done so far. I also had to behave like a man as my character gets possessed by a man. Were you a fan of horror films when you were a kid? I am a big fan of horror films. Growing up I would watch horror films with my brother. My favourite horror film was Nightmare At Elm Street. I also like to watch zombie films. Vikram Bhatt personally believes that ghosts exist. He is a firm believer in afterlife phenomenon. Do you also believe in it? I do believe in afterlife but I have never experienced any paranormal activity. I don't even want to experience it. At such an early stage of your career wouldn't it have been better if you had played a more glamorous character? Every actress is doing a glamorous role or wants to wear a bikini or wear short clothes in films so what is so special about it? I believe in doing things that are different. I would like to do something where I stand out of the crowd. For me, a film like 1920 Evil Returns is special as the film is centred around me. Intimacy in films has become common, yet actress are always questioned about whether they are comfortable doing such scenes. What do you have to say about it? I want to be a sensibly glamorous girl. I don't want to strip on screen just for the sake of it. Today audiences don't overreact if there is a kissing scene in a film. It is no longer a big deal like it was when Murder was made. I think it has to be aesthetically done. It doesn't have to look cheap. Sometimes, filmmakers just put in a kissing scene to attract the audience. Of course I am an actor so I can't say no to all these things. You are a trained singer and have done playback in two of your films. Any plans to pursue it as an alternative career? I haven't sung in this movie but I haven't given up on it. I do a lot of live shows and in future if there is an opportunity in playback I would definitely do it. Is there any particular actress that you would like to sing for? I would love to sing for Kareena Kapoor. I am a big fan of hers. In fact, I am looking forward to Talaash as I also like Rani Mukerji and Aamir Khan. Aamir is one actor that I have respect for. Ghulam is my favourite film. He is a sensible actor. And what about Salman Khan and Shah Rukh Khan? Salman Khan is my favourite actor. I love the kind of person he is. He is moody and he openly accepts it. He is what he is. Shah Rukh Khan is the epitome of, or god of, romance. Even if he romances a tree the film will be a hit! In three years in the industry you have just done three films. Are you purposely choosing not to take up a lot of work? I am being a little selective and going slow as I don't want to do anything and everything. I don't want to come across as someone who is doing a film for the sake of it. I want to be known for my films rather than the number of films that I have done. I never imagined becoming an actor. I always wanted to be a singer. I participated in Sa Re Ga Ma Pa. Zee TV later offered me a part in their television series Ghar Ki Lakshmi Betiyann. PIX: Kamasutra, now in 3D, and starring Sherlyn Chopra!